I just love the scene in Gone with the Wind when Scarlett rips down the velvet curtains and makes a wonderful dress. 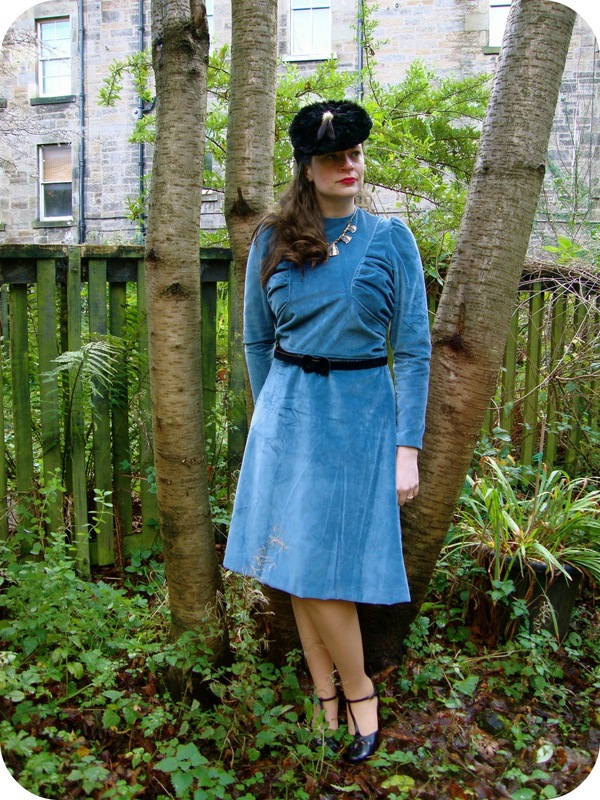 I've gathered inspiration from Scarlett O'Hara this week (though I've made my dress out of choice not necessity) and have tackled a pair of old velvet curtains in my stash to turn them into a dress using the pattern McCall 3456 from 1939. I got a pair of these curtains for relatively cheap (as far as velvet curtains go--only £10). The slightly creepy thing is that I met the man who grew up with these curtains in his house. He was the one selling them and he talked about how great it was to have these velvet curtains growing up and how they kept the place warm. He seemed very interested to hear (and not in the least way upset) that I planned to use them as fabric. In fact, part of me wants to go back and visit him to see if he recognises the curtains! How weird would it be to see someone walking around in your childhood curtains? hahaha! Well, for being so old--they were in remarkable condition. 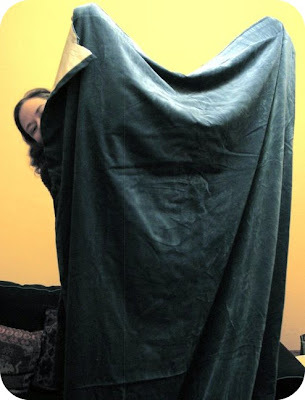 I used the majority of both curtains and cut the curtains in one with the lining (to act as underlining since the back of the velvet wasn't very soft). I originally dry cleaned the curtains but also tested out a large swatch on the cold wool cycle of the washer and it came out fine (nap was still super soft). So that's how I'm thinking of taking care of the dress in the future. This dress pattern was hailed in the December McCall's magazine as the hottest trend for necklace dresses (i.e. they look great as a backdrop with some serious bling!) Even looking at the pattern cover, it looks like velvet!! This dress is also really interesting because it has gathers at the side seams in addition to the interesting yoke gathers. Also the waist line dips in the back--extending the back buttons! I haven't made a matching belt yet, though I have cut out the fabric. I think I will finish it. I find it interesting that the pattern envelope has the figure wearing the belt with the buckle at the back! I can see how this would give a nice smooth line in the front--I'll have to give it a try! I'm quite pleased with how the dress turned out. I was a bit concerned that perhaps the fabric would be too thick but it was absolutely fine. The neat bit about using the thicker fabric is that the lapped seams making it look like cording was applied to all the seams--I really like that detail. The dress closes down the back with 9 buttons (the pattern calls for 10 but I only had 9 self-covered buttons). Covering the buttons took almost 2 hours--this fabric is thick and so it's really hard to get the snap backs on these buttons. In fact, I don't think the buttons will last and I need to think of some alternatives. I really like how the self-covered buttons look but the fabric is just too thick. There's been some good suggestions over at my Sew Weekly post on how I might be able to solve this. One suggestion was to try and put in a side zipper and leave the buttons as decorative but try to secure the caps on them a bit better. Another idea was to recover the buttons with a matching print fabric (that's thinner). I'm almost wondering if a nice silk fabric in the exact same colour might work--I could always make a matching belt to the buttons. What do you think? The only bad thing about working with velvet is ironing!! Arrrgghhh. I followed the instructions and kept the iron upright and put a press cloth over it and gently rubbed the fabric against the iron. I found this good for seams but it didn't work so well for getting wrinkles out. I think I need to get a velvet pressing board for the best results! In the meantime, I'll try to use another piece of velvet (right sides together) and gently steam the wrinkles. If ironing is my least favourite part of working with velvet then my FAVOURITE part is the feel of velvet! I just love running my hands across the fabric. So soft!! I really want to try this pattern in silk velvet. Wouldn't that be dreamy (and probably so much easier to work with)? What do you think? Do you think I would have made Scarlett O'Hara proud? Have you ever worked with velvet? What about velvet curtains?? Debi, you definitely did Scarlett O'Hara proud! This is wonderful, I love it...can't believe they used to be curtains! The buttons down the back are darling! Gasp, I love this pattern! Both front and back are awesome, and it looks fantastic in blue velvet! 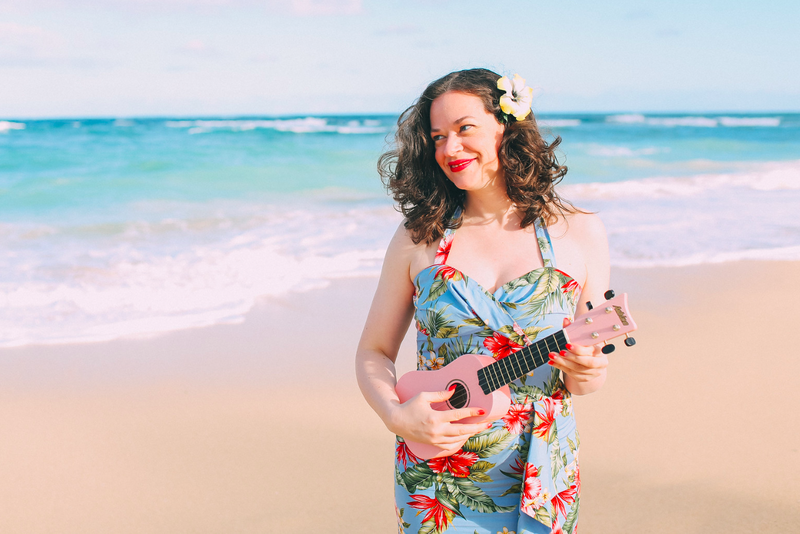 And yes, your blogoversary posts made me wonder when mine was - about 4 days after yours! It is wonderful! I agree with Marie - the buttons down the back look gorgeous - it's a shame you think they won't last that long. As for the idea of someone walking round wearing my childhood curtains - well, I would have to feel very sorry for them!! Ha ha!! I've never worked with velvet before, but I'm sure I will at some point. Very impressed and it looks fab. Don't think I could challenge a fabric that is hard to iron. That would indeed send me over the edge. You are so talented. you had me at Scarlet..... what a great dress! You were quite impecible with the details! Okay, your post just jogged my memory and I just have to share a hilarious video with you. Have you ever seen Carol Burnett's "Went with the Wind"? The link is for a version on YouTube. You can jump to just before 3:19 if you don't have time to watch the entire clip. Wow! Fabulouse job Debi! I would have been concerned at gathering velvet at the bust, but it doesn't look at all bulky. I love the back view! I am just a little worried at the prospect of washing something that has already been dry-cleaned. Someone told me that the dry-cleaning solvent residue would react badly to water and leave the garment spotted...? If this is not true I would be very pleased to hear it as I loathe taking things to the dry cleaners jsut because they have been before. I love that part of Gone With The Wind! And your dress is beautiful! This is SO beautiful! Great job! The blue is such a great color, and the style is amazing! the buttons! i just love the buttons! gorgeous dress. as always! Totally gorgeous. I adore the gathers in the bodice and the little pouf and gather in the sleeve cap, all so deliciously feminine. Wonderful dress! And such a creative use of old drapes! I love it. 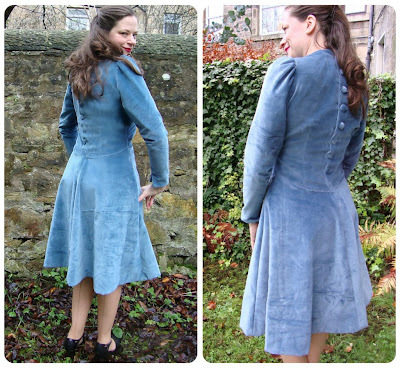 A note about the buttons, I have a forties jacket with fabric buttons which are simply fabric over some batting and the back secured with a running stitch. The buttons were sewed to the jacket with thick thread (called 4 cord cotton, I have an old spool of my mother's). I got an early Christmas present of a digital camera so I'll get some pictures and send them to you so you can see what I'm talking about. Also, when you press the velvet, have the nappy side against a turkish towel (thick terry cloth) on the ironing board and press the back of the velvet. My mother taught me how to do that and her father was a professional tailor. Great job on the dress! "She wore blue velvet ..." is now singing in my head. Lovely silhouette on you. Really like the side bodice shirring, so unexpected. Personally, I think that some interesting plastic buttons would be fine on this dress, and far easier to do up when you don it. Steaming velvet works far better than pressing ... it might be worth a little expense to have the cleaners steam it for you -- I have a friend who does all her own laundry, then carries her clothes to the cleaners to be pressed. I ADORE this dress, Debi! Lovely dress! I love the design and the fabric and how you styled the outfit. Oh WOW!!! That dress is a whopper. I adore that you used curtains, and it's a fabulous style for velvet! The color is super flattering on you, and I love the gathers. Fantastic details make this dress truly superb! Wonderful and inspiring! As a huge GWTW fan too, I salute you!!! I commented when this post first came out saying it was my favorite dress you've made. I would do the side zipper and leave those buttons they are so pretty on there in the velvet. I'm making a retro dress right now with a side zipper the first I've done since I can remember. I still can't find this pattern I love it too!! 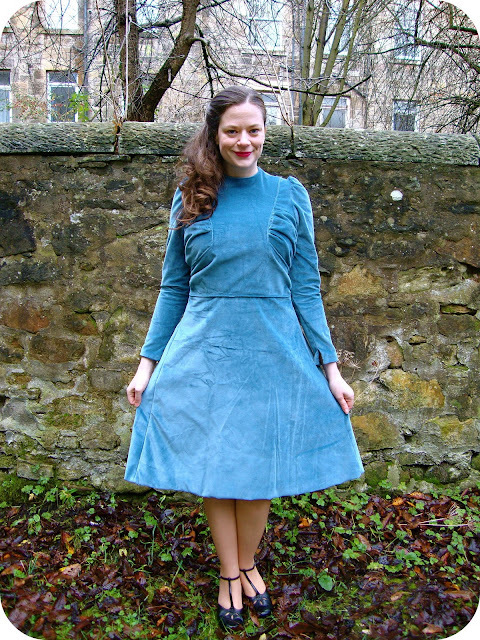 The dress is gorgeous (love the color, too), and it just seems like the pattern was made for velvet! It doesn't look like the fabric is particularly heavy, so I'm so it will be great to keep you warm without looking bulky. Beautiful! The dress is gorgeous, from my favourite era. I have worked with velvet but having to tack the pieces together before sewing so it doesn't slip makes it a long process, I haven't tried gathering. That looks a difficult dress to make - you did a great job. I love the feel of velvet too. I have made a velvet bag and I would like to make a velvet skirt at some point! Ooh, I love the back of that dress! I love the bodice gathers on the dress, such a nice detail. And love that you'll be walking around in curtains too - but how stylishly! Oh I love the bodice ! Oh I love the back too! Oh I just love it! The back of this dress is gorgeous! I love the buttons and the dropped wasit-line. how darling! I looooooooove it! Lovely! I would kind have to laugh if I saw someone wearing my old curtains. They had people, houses, cars and bicycles on them. Those old curtains are much better-suited for dressmaking! I have a random question for you though. Been wondering about this for a while, and now you've made a dress in this style I have someone to ask! How on earth do you do up the back buttons? Or is it impossible to get in and out of these styles without a lovely assistant to do the buttons? Debi I love the scarlett o'hara channelling! The dress is an awesome style- amazing gathered sides. Yes, I have sewn with velvet before and it is a bear. I bought an extra yard just to use for ironing. I was so, so careful because I heard that the nap has a tendancy to crush if you look at it wrong! I love the details of this dress- I need to get cracking and dust off the ol' sewing machines again.